Rittal’s new support arm range, in one uniform design, covers all the load ranges up to 180 kg. Wide-ranging and modular, with Rittal support arm systems, control panels can be easily and accurately turned, lifted and swivelled, ensuring operators can monitor their machine at any time. Nowadays, support arm systems need to be quick to assemble, simple to adjust, suitable for individual installations, designed in a uniform way, capable of bearing high loads and must facilitate cable management. Rittal’s support arm system 60/120/180 meets all these requirements in full. Support arm systems can be created for the 60, 120, and 180 kg load levels (relative to a jib length of one metre) with a uniform function, installation and project planning system. The support arm system, consisting of support section, intermediate hinge and angle pieces, can be mounted on top of a machine or on a side panel. Wall and base mountings, as well as flexible top-mounted joints and wall mounted hinges, are available with horizontal outlets for assembly. To help select the right support arm system, an interactive online configurator ensures rapid engineering, helping to configure the appropriate support arm solution with minimal effort. 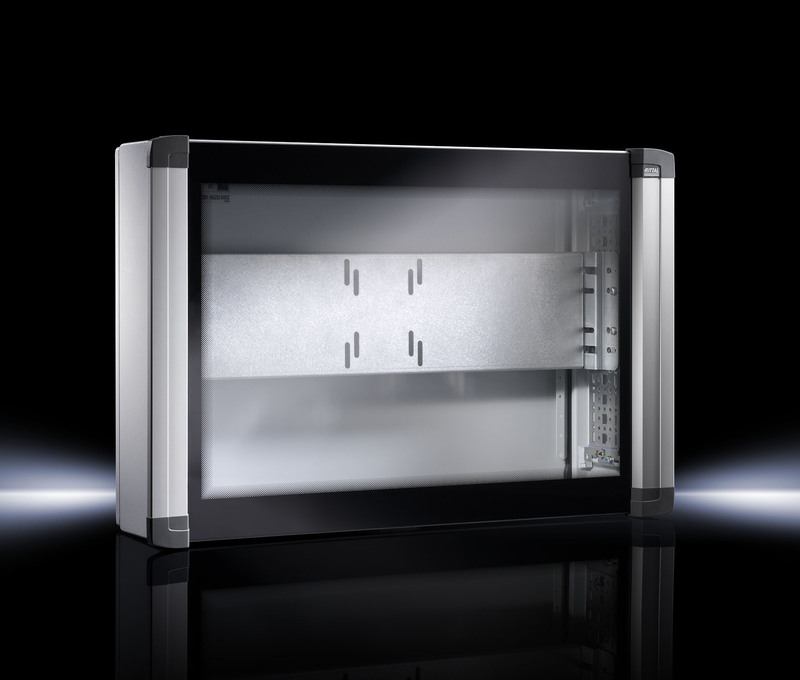 Rittal’s stylish housings, with a protection category of IP 65 shielding devices from exposure to dust and water jets, are designed to accommodate TFT screens up to 24” (measured along the diagonal) in the popular 16:9 and 16:10 widescreen formats. A full-width viewing window made from a single-pane of safety glass maximises the display area and a combination of rounded edges and aluminium grips prevent injury. The side facing the operator has an attractive look and feel. Housings containing TFT screens can be mounted quickly and efficiently thanks to a holder with the VESA 75/100 mounting hole pattern. A hinged door on the back of the housing provides easy access to the device. Manufactured from sheet steel, Rittal’s housing measures 650 x 450 x155 mm. To provide additional ways of connecting to a machine according to the needs of the application, the housing can easily be mounted to a support arm system from Rittal’s CP 60/120/180 range. With eccentrically mounted support arms, the housing can be placed in various positions, such as in niches. For the fitter’s convenience, pre-punched holes are provided in the reinforcing plate. One of the recurring themes to come out of this year’s Data Centre World Expo in London is how best to manage the spiralling cost of cooling data centres and the ongoing challenges presented by this. With processors and servers becoming ever more powerful and their demand for power continuously increasing, managing unwanted heat has become increasingly expensive. Data centres are having to work even harder to keep their environments cool or look for innovative and costs effective solutions in order to reduce energy consumption. 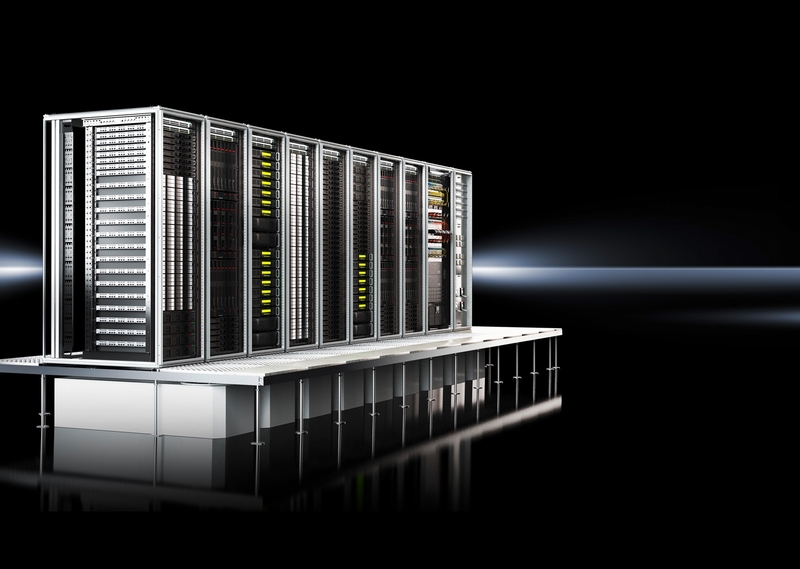 Rittal now offer customers an optional efficiency package to determine and display the energy consumption in a RiMatrix S standardized data centre via the power usage effectiveness (PUE) value. Installed in the sub-distribution or enclosure suites, the PUE efficiency package for the RiMatrix S is hardware and software that gives IT administrators information on efficiency values in the data centre quickly and simply. Presentation of the results and their preparation is performed in the Rittal RiZone data centre infrastructure management (DCIM) software. Consisting of intelligent socket systems (Power Distribution Units), instruments for measuring power consumption and the RiZone DCIM software, this optional package allows administrators to easily optimise the efficiency and energy consumption in the RiMatrix S.
RiMatrix is a complete data centre portfolio comprising of standardised components: a defined number of TS IT server and network racks, climate control, power supply and backup systems, as well as monitoring systems. Together, these form a complete server module. By concentrating on standardised data centre modules and ideally coordinated components, the RiMatrix S achieves an extremely low value up to 1.15.